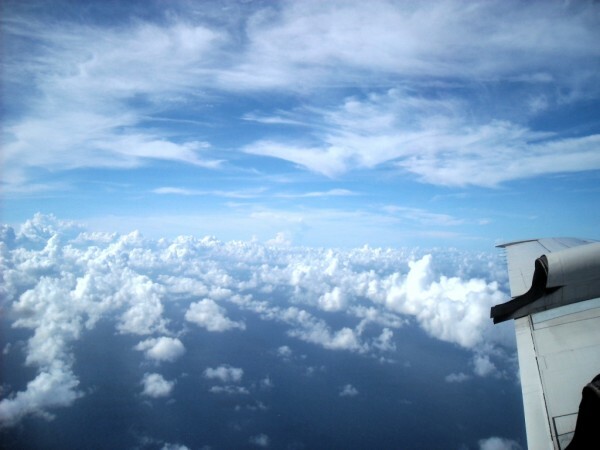 Cloud streets are long rows of cumulus clouds oriented parallel to the direction of the wind. Check out these cool images! Cloud streets are long rows of cumulus clouds that are oriented parallel to the direction of the wind. They’re formed by convection rolls of rising warm air and sinking cool air. Rising warm air cools gradually as it ascends into the atmosphere. When moisture in the warm air mass cools and condenses, it forms clouds. Meanwhile, sinking cool air on either side of the cloud formation zone creates a cloud-free area. When several of these alternating rising and sinking air masses align with the wind, cloud streets develop. Cloud streets are technically called horizontal convective rolls. Convection rolls and the formation of cloud streets. Image via NOAA. 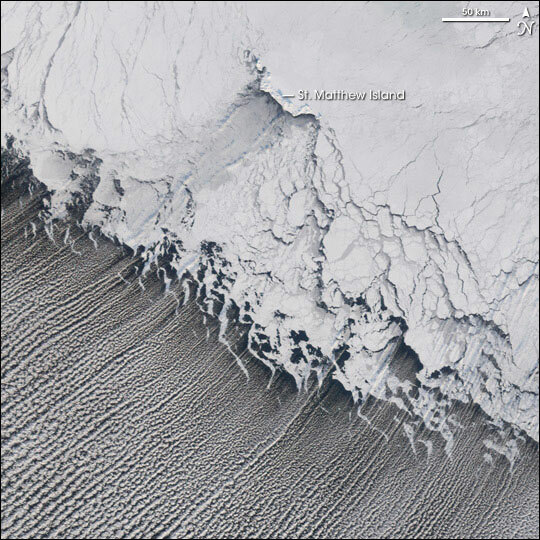 Cloud streets are most readily seen in satellite photography, though they can be viewed from the ground too. The U.S. National Aeronautics and Space Administration (NASA) has taken some amazing photographs of cloud streets over the past few years with the MODIS (Moderate Resolution Imaging Spectroradiometer) instruments on board the Terra and Aqua satellites. The satellite images on this page are from these instruments. 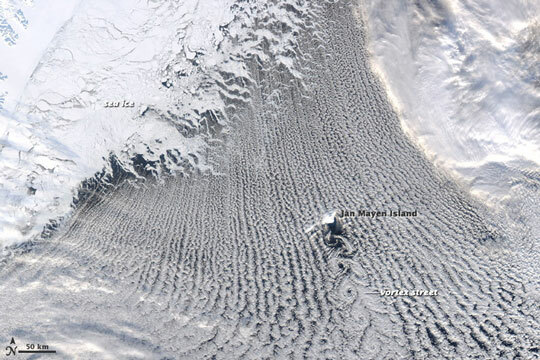 Cloud streets typically form fairly straight lines over large flat areas such as the ocean. However, geological features like islands can disrupt the flow of the wind and create spiral patterns in the cloud streets similar to the way in which large boulders create downstream eddies in rivers. 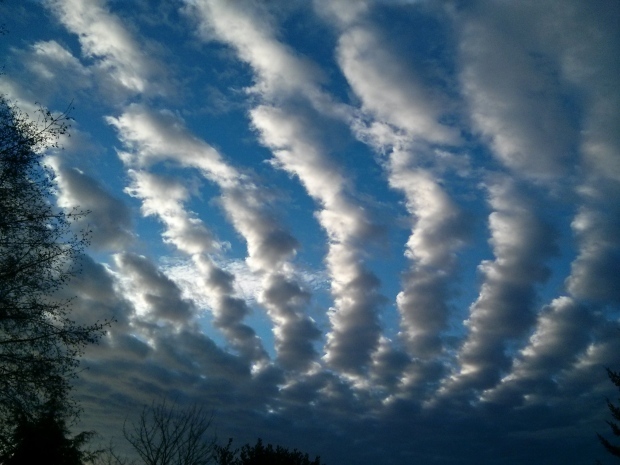 The spiral patterns in clouds are called von Karman vortex streets. These vortices were named after Theodore von Kármán, a co-founder of NASA’s Jet Propulsion Laboratory, who was one of the first scientists to describe this type of atmospheric phenomenon. Meteorological phenomena such as cloud streets and von Karman vortices are a manifestation of Earth’s atmosphere in motion. 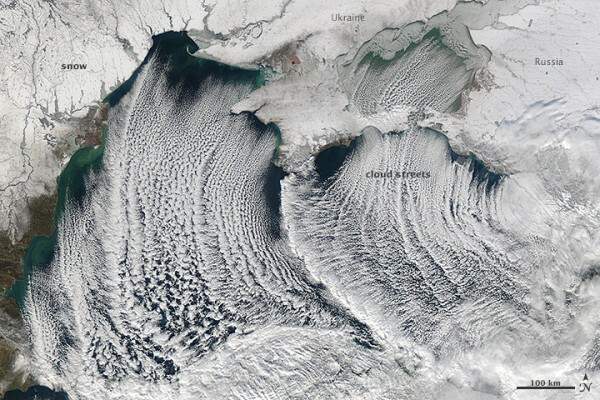 The MODIS instrument on NASA’s Terra satellite captured these cloud streets over the Bering Sea on January 20, 2006. 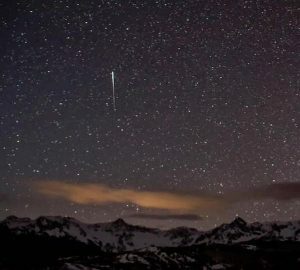 Image via Jesse Allen/NASA. Read more about this image. The MODIS instrument on NASA’s Aqua satellite acquired this image of a von Karman vortex that formed off the coast of Greenland on February 24, 2009. Image via Jeff Schmaltz, MODIS Rapid Response Team. Read more about this image. Morning cloud streets over Vancouver Island. Image via CTV News Vancouver Island. Clouds streets are most readily seen in satellite photography, but this aerial image comes from Rosimar Rios Berrios, via NOAA’s Hurricane Research Division. Bottom line: Cloud streets are long rows of cumulus clouds oriented parallel to the direction of the wind.